The Breitenbush starts from the crest of the Cascades north of Mount Jefferson and is one of the major tributaries of the North Santiam River. 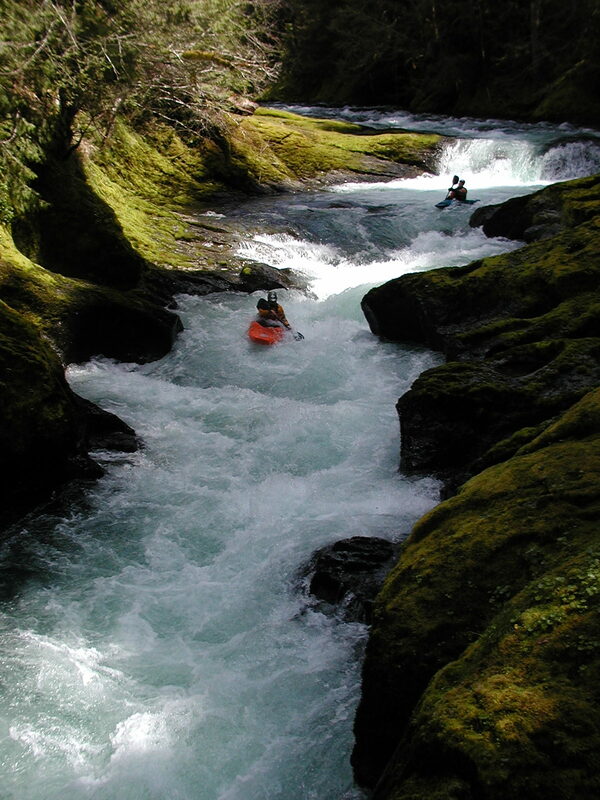 This run is one of the best intermediate runs in the Cascades with numerous rapids, crystal-clear water, and beautiful scenery. The many technical drops throughout the run are great for practicing or learning creekin' skills. The Breitenbush is a tough river to rate. On the one hand, the difficulty of the individual drops are primarily Class 3 with a couple harder drops sprinkled throughout the run. On the other hand, many of the rapids are steep and it can be difficult to see the bottom of the rapid without getting out of your boat. This can be intimidating for first-timers. On a good day, boaters will get off the river and feel like it was a Class 3-3+ run but on a bad day (I know folks who have hiked off this river) it will feel more like Class 4. Immediately below the put-in is a fun rapid with several holes and funky currents. This is the warm-up before the next rapid, The Slot, which is generally considered the hardest rapid on the run. The Slot consists of a deceptively tricky 4-foot ledge before the river narrows to a 10-foot wide slot for the next 25 yards. The next couple miles contain some classic rapids set in a stellar gorge. Be sure to be on your toes for wood. After a brief calmer section, the rapids pick up again at S-turn Rapid. S-turn begins with a river-wide ledge which can have a big hole on the left. Immediately below this ledge the river races through a short zig-zag section with a big hole in the first zig. Scout on the right. After another mile of good rapids just after passing Humbug Creek, the river opens up and is quiet until passing under the road bridge at mile 6. The stretch below this bridge is markedly different from the upper 6 miles. Big, pushy rapids are separated by small boulder gardens. Shortly below the bridge boaters encounter an island on a sharp left turn. This is the lead in to Barbell Rapid. Barbell Rapid should be scouted (not without difficulty) on the drive upriver, 2.4 miles above Detroit, since it is even more difficult to scout from the river. The right channel contains a sticky ledge that should be run on the right with momentum. The left side is a steep boulder garden. Much of the current pushes into the right wall at the end of the rapid. Be careful as this wall is undercut. A half-mile below Barbell is Woo-Man-Chew, a 7-foot waterfall into a deep pool. Scout on the left by landing at the low concrete structure. Woo-Man-Chew looks a lot worse than it really is. At low and medium flows, a run down the middle with momentum is pretty forgiving. At high water this drop can recycle boats and swimmers, particularly boaters using small boats, for extended periods of time. When Detroit Reservoir is full, the lake reaches just above the small, unnamed Forest Service campground just upstream of Detroit. When the reservoir is low, the rapids continue past the town of Detroit but finding a place to take-out is difficult. Rafting Note:The Breitenbush is rarely rafted and I'm not sure why. Maybe rafters get turned away by the narrowness of the river and the potential for wood. That's a shame because for adventurous rafters the Breitenbush is a hoot! Small boats make the run a lot easier and a whole lot more fun. I've rafted it as low as 650 cfs without too much trouble but I think somwhere above 1200 is ideal. Wood can make for some interesting portages. Be sure to scout the Slot on the way to the put-in and set safety at the ledge. This drop has pounded some pretty good boaters, particularly at medium flows (1000-1500 cfs). Barbell can also be scouted from the road before the trip. The Breitenbush River has a tendancy to collect wood in some years. It has been pretty clean lately but each winter there seems to be a new log or two in unexpected places. Be sure to scout what you can't see. From Detroit, OR, follow NF-46 upstream about 1.4 miles to a large pull-out on the left. Park near the gate at the upstream end of the pull-out where a road goes to the gauging station on the river. To reach the put-in, continue upstream on NF-46 about 7.6 miles to the junction of NF-46 and NF-2231 and the bridge over the river. There are several good places to launch around the bridge. 800cfs is a great first-time flow. I personally like 1200-1500cfs. 2500cfs is very fast and big. Definitely steps up a class at high flows. Check out Jason't description of this run. Also a trip report on Nate's blog.